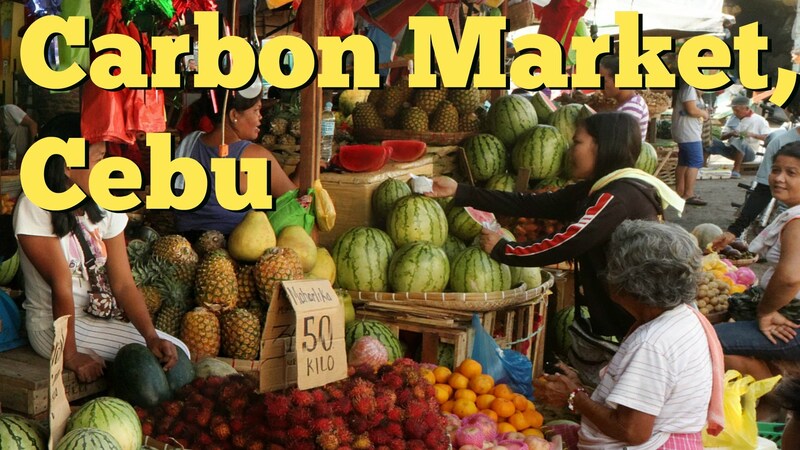 Cebu’s Carbon Market is the oldest and largest farmer’s market in Cebu City, located in the Central Visayas region of the Philippines, and is a major tourist attraction (Wikipedia, September 2017). In 2014, Cebu’s Carbon Market was devastated by a terrible fire displacing hundreds of vendors (Inquirer News, January 2014).. 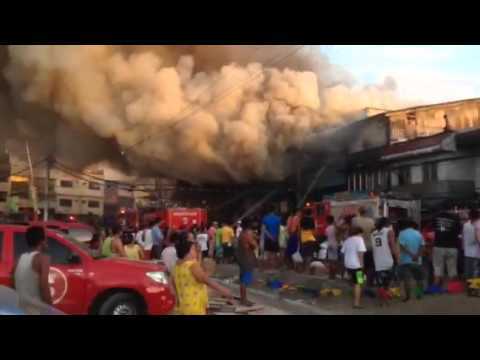 In 2014, Cebu’s Carbon Market was devastated by a terrible fire that raged on for two hours at this city’s premier public market, razing to the ground a whole block of the market in Sitio Warwick Barracks. More than 100 stalls and hundreds of subsistence vendors lost their livelihood and their homes (Inquirer News, January 2014). In August 2017, the 2017 NEXTGEN participants, Camillo Geaga, Marc Butiong, and I visited the new housing settlement of the displaced vendors. 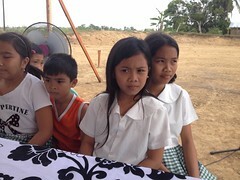 They live in a patch of land in Talisay City, about 11 kilometers away from Cebu’s Carbon Market, their place of livelihood. Displaced women vendors of Cebu’s Carbon Market tell their stories. They were displaced due to a devastating fire in 2014 and still have to be properly resettled. After the fire, the women vendors organized themselves and formed an urban poor association, through the support of the Visayas Mindanao People’s Resource & Development Center (VMPRDC). We visited these women vendors and their families. They shared with us their heartfelt stories of earning meager wages, barely enough to feed their children. 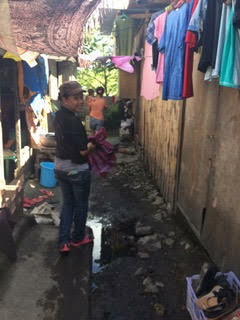 Some of the displaced women vendors of Cebu’s Carbon Market cried when they shared with their heartfelt stories. For the last three years, these women vendors are still waiting for restitution and justice. Without adequate insurance, government assistance or social service protections, these women do not have any other recourse. 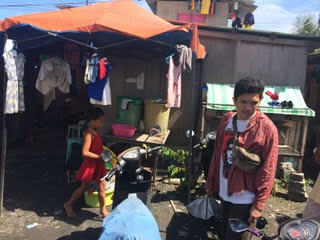 Emz Aliviano of Visayas Mindanao People’s Resource & Development Center (VMPRDC) showed us the substandard housing conditions of where these women vendors and their children live. 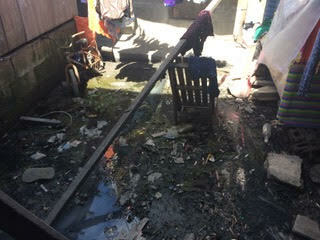 I saw that standing, filthy water surrounded the substandard housing of the displaced women vendors. There was clearly a lack of proper water drainage surrounding their homes and that it created a public health hazard for the women, their families and their children. 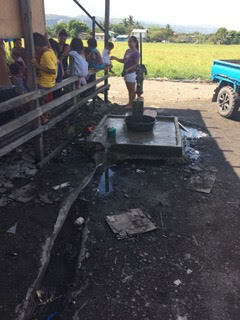 There was one water well that provide access to drinking water to 67 families. 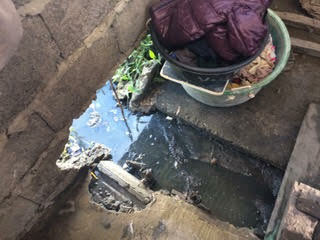 It has an inadequate drainage system where the water flows out into a puddle of standing, filthy water. 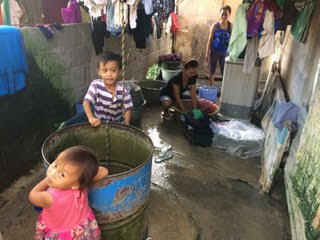 Last month, one vendor family lost a toddler to dengue fever, due to the unsanitary conditions of the standing water and the lack of proper water drainage around the homes. 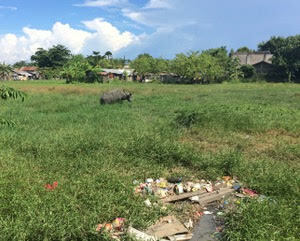 The filthy, standing water creates a public health hazard as it breeds mosquitoes promoting dengue fever and other mosquito borne diseases. 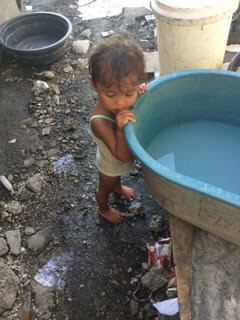 This entry was posted in Diaspora Giving, Philippine poverty, water, water & hygiene and tagged environmental clean up, giving, Philippine poverty. Bookmark the permalink.